Bridget is a baby on the move. She’s here and there and then over there. We are starting to get cabin fever so I have been trying to find activities to mix things up for her. Here are my criteria: must be on a weekend, relatively inexpensive, within 30 minutes of drive time, conducive for a baby under one, and available during the winter months. This has proved to be a challenge because most local activities are held on weekdays (annoying!). As a working Mom, it hasn’t left us many options. So, I turned to good ol’ reliable Google (seriously, what did we do before Google?) 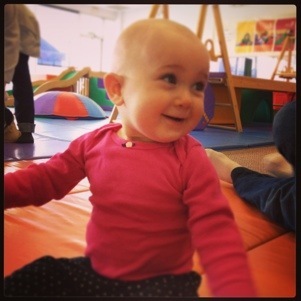 and found a play and music class at Gymboree (an affiliate of the children’s apparel store). We signed Bridget up for a free trial class and we attended yesterday. Since Bridget slept in till 6:00 am (yes, that is sleeping in for her), she had a later than usual morning nap and a full belly to take on the class. We had so fun playing, climbing, sliding, rolling, and singing. Bridget couldn’t explore the unfamiliar grounds quick enough. She couldn’t decide which ball to chase first. She had the biggest grin on her face when she took the “parachute ride,” and looked like a ping pong spectator watching everyone sing and motion through the songs. And then she fell asleep before we even made it out of the parking lot. It was a well-spent 45 minutes and worth the $15 once or twice a month. I’m still looking for more ideas of activities in northeast Ohio. Ready, set, comment and share your suggestions below.